FRICTION SERIES 2014 continued @PG San Francisco on March 14th! Climbers of all ages and abilities joined in the fun on incredible routes set especially for the competition by PG’s team of talented and hardworking route setters. Treats from pizza to massage were enjoyed by competitors, and prizes were in good supply thanks to our generous sponsors. Advanced #18 was a particular favorite of the night. 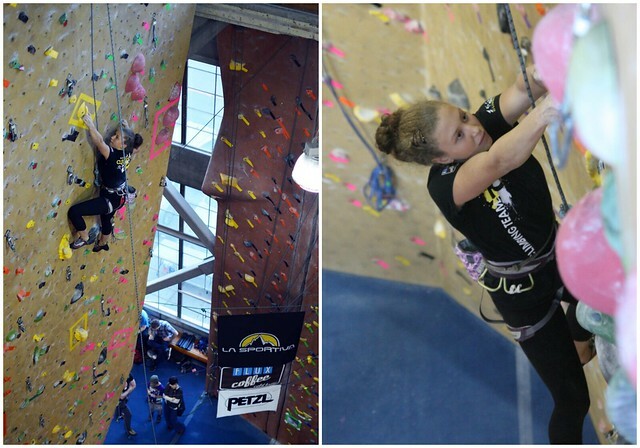 Here Sam, from PGSF’s climbing team, makes her way up it on the 10 Degree wall. Nicely spaced, good flowing movement made it an advanced favorite of the comp. Sam – a member of the PG SF’s Youth Climbing Team. 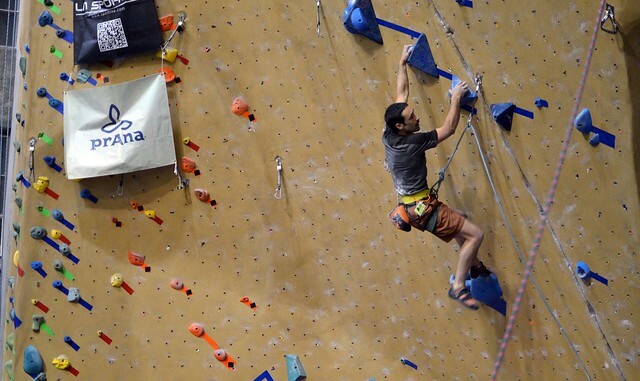 Rec #8 was a long route in the center chamber offering a variety of holds, challenging competitors at the high end of the Recreational category. The tenuous start of Open #25 provided much entertainment for onlookers. The balancey beginning slab section leading into dynamic moves to enticing jugs thwarted many a contender, though not Men’s Open winner, Andy Lam, who flashed the route in good style. A competitor on Open route #25. 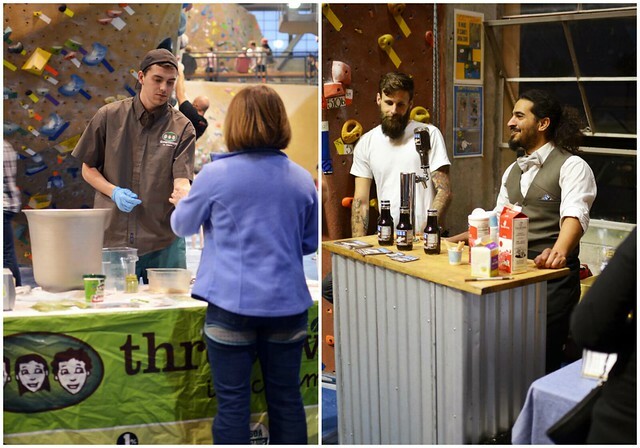 A trinity of treats were offered by some excellent local businesses: Strike Brewing Company, Three Twins Ice Cream, and Flux Cold Brew Coffee. In the midst of all the action climbers juiced up with a Flux. After scorecards were turned in it was time to celebrate with a Strike beer and some pizza. Beloved Planet Granite MC, Patty T., managed to have a chat with former PG staffer Colin Delahanty who was showcasing his beautiful photography of Yosemite Valley. Bringing the focus to the outdoor community,the PG Gives Back beneficiaries were represented by Environmental Traveling Companions and Big City Mountaineers. The Access Fund and Bay Area Climbing Coalition were also set up to connect with PG climbers about upcoming clean-ups and issues affecting our outdoor climbing access. Colin Delehanty and MC Patty. | Matt from The Access Fund. The 5.10 table generated a lot of excitement as they tossed free schawg out into the crowd of psyched climbers! The prize table was the place to be once the results were in. The climbers who came out on top walked away with some amazing prizes, thanks to our generous sponsors, and many lucky raffle winners claimed the rest. Free schwag and prizes always get the crowd psyched! All in all the night was full of fun, smiles, and plenty of try-hard. 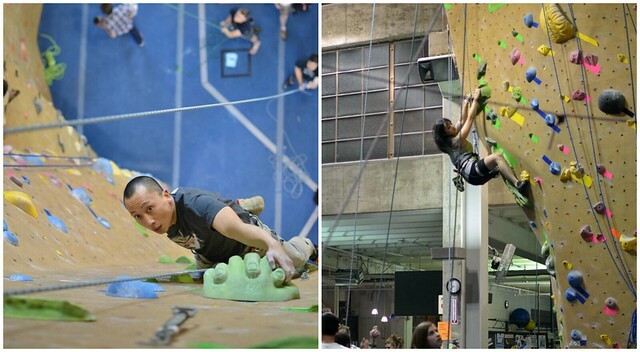 We’re psyched to see you all @PG Sunnyvale for the last round of FRICTION SERIES + Onsight Final on April 18th! **A BIG thanks to our sponsors!